Mild every day formula for all hair types, sensitive scalps and damaged hair. Beautiful hair naturally and safe for children. Real Aloe Shampoo is perfect intense scalp relief, repair and rejuvenation. Now with even more organic and natural ingredients, this formula will gently clean and penetrate the scalp without harsh chemicals or soaps. Aloe Vera has been respected by practitioners for centuries for its ability to provide a healthy skin and scalp by nourishing and moisturizing the most sensitive scalps. Argan Oil goes deep into the scalp to moisturize and nourish leaving your hair softer to the touch. Oat Beta Glucan improves hair glossiness, increases tensile strength and helps reduce hair breakage. Apply to wet hair, massage well, rinse and follow-up with our RealAloe conditioner. 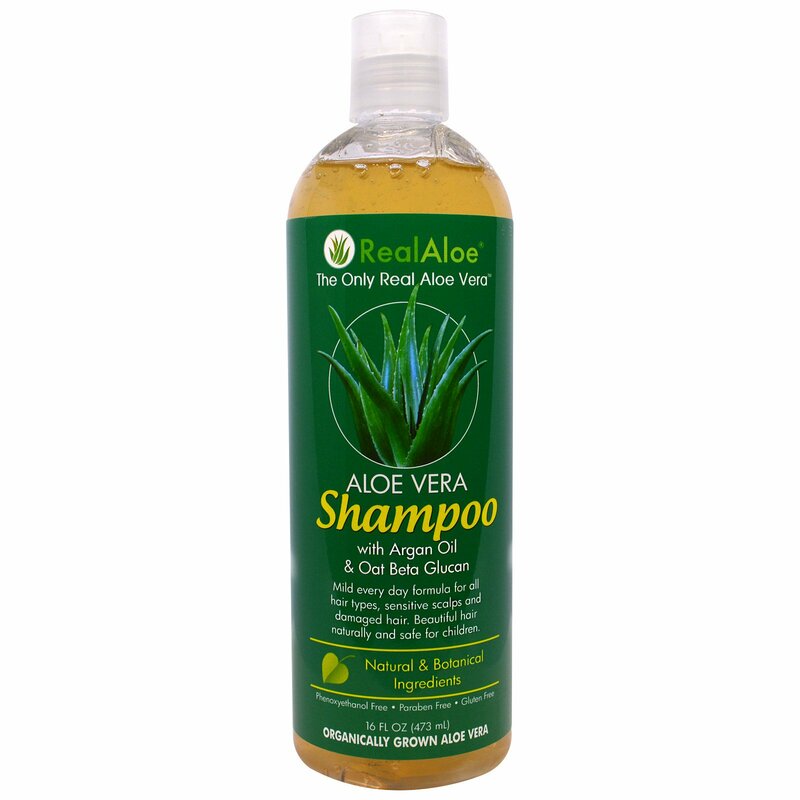 Real Aloe Shampoo has a thinner consistency than most commercial shampoos so it penetrates better into the scalp. Organic Aloe Vera Gel, Deionized Water (Aqua), Prunus Serotina (Wild Cherry) Bark Extract, Simmondsia Chinensis (Jojoba) Seed Oil, Argania Spinosa (Argan) Kernel Oil, Oat Beta Glucan, Chamomilla Recutita (Matricaria) Flower Extract, Hamamelis Virginiana (Witch Hazel) Leaf Extract, Hydrastis Canadensis (Goldenseal) Extract, Calendula Officinalis Flower Extract, Humulus Lupulus (Hops) Extract, Equisetum Arvense Extract, Decyl Glucoside, Coco-Glucoside, Coco-Glucoside & Glyceryl Oleate, Panthenol (Vitamin B-5), Organic Quillaja Saponaria Extract (Soap Bark), Pure Yucca Schidigera Extract, Hydrolyzed Lupine Seed Extract, Sodium Benzoate, Gluconolactone, Caprylyl Glycol, Ethylhexyl Glycerine, Undecylenoyl Glycine, Capryloyl Glycine, Citric Acid, Xanthan Gum, Glycerin, Aloe Vera Oil Fragrance.